When their ball broke a pane of glass in their neighbour's greenhouse. 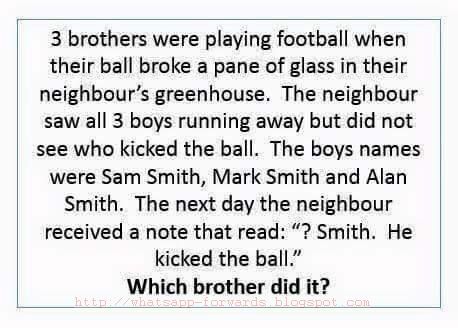 The Neighbour saw all 3 boys running away but didnot see who kicked the ball. The Boys names were Sam Smith, Mark Smith and Alan Smith. The Next day the neighbour received a note that read: "? Smith. He kicked the ball." So the Note read : Question Mark Smith.